If you’re creating a disinfectant program for your cleanroom, be sure to check these six points before making a decision. Disinfectant programs are vital to pharmaceutical and medical device manufacturers. Cleanrooms must not only be cleaned, but also disinfected to remain compliant. A program entails a disinfectant rotation as well as the disinfectants themselves. Here is a checklist to consider when choosing disinfectants. Know the efficacy level of your options. Whether using a disinfectant or a sporicidal agent, it needs to be effective against the specific microorganisms present in your facility. Know the contact times required to work. Each product will vary in the length of time it needs to make contact to kill microorganisms. For compliance, contact times less than 5 minutes is ideal. Anything longer than that will likely require re-wetting of the surface, which can increase chemical costs. There are many varieties of pass-through systems for cleanrooms, and each meets different unique needs. Here are 3 common varieties. 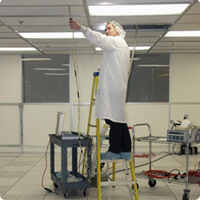 Pass-through systems are an important part of many cleanrooms. They are necessary for a variety of parts, materials, documents, critical applications, equipment, and even personnel. The type of system you need depends on what you need to move from one side to the other as well as your cleanroom class. Here are three very different kinds of pass-through systems to consider. When it comes to cleanroom air sampling methods, you will find different methods are appropriate for different classes of cleanrooms. It is important to analyze each option to find the best fit for your needs. In parts 1 and 2, we covered sedimentation and most impactor methods. In this article, we will conclude the list with impingement and gelatin membrane filtration. A continuation of comparing air sampling methods for the cleanroom – be sure to choose the one that can be validated for your compliance. When it comes to choosing an air sampling method for your cleanroom, you need to do your homework. Depending on your cleanroom class and other needs, some options will be more suitable than others. In part 1, we covered sedimentation and slit-to-agar. We will pick up here with two more impactor methods. Proactive companies know the importance of an active air-sampling program in a cleanroom. As with anything, each method has different benefits and problems specific to compliance needs. Here are the first two of the six methods we will discuss.